Explanation: Looking down on the Northern Hemisphere of Mars on June 1, the Mars Global Surveyor spacecraft's wide angle camera recorded this morning image of the red planet. Mars Global Surveyor's orbit is now oriented to view the planet's surface during the morning hours and the night/day shadow boundary or terminator arcs across the left side of the picture. 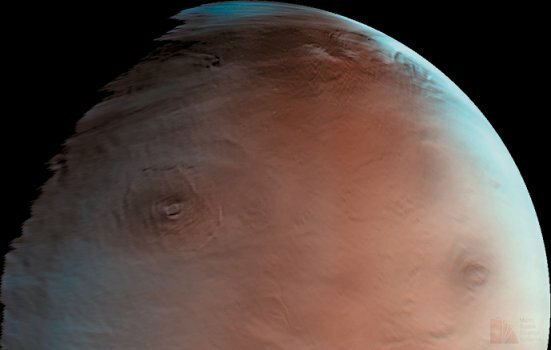 Two large volcanos, Olympus Mons (left of center) and Ascraeus Mons (lower right) peer upward through seasonal haze and water-ice clouds of the Northern Martian Winter. The color image was synthesized from red and blue band pictures and only approximates a "true color" picture of Mars.